At Kongens Nytorv you find the oldest drinking establishement in Copenhagen. 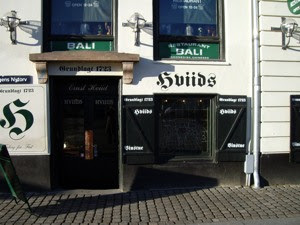 Hviids vinstue has served beer, wine and aquavit to the citizens of Copenhagen the last 286 years. We went there to have a beer and a Gammel Dansk Bitter or a "pilsner og en lille en", as they say in Denmark. This as we were determined to eat open sandwiches in another very well known restaurant, Peder Oxe.